If I had to pick just the one eyeshadow palette to use for the rest of my life, it would be either Lancome Auda[City] in Paris, reviewed here, or Julie Hewett's Breathless Palette, reviewed here. Both of these contain soft shades I wear on a daily basis. This year, Lancome has come out with another 16-shadow, soft-shade eyeshadow palette - Auda[City] in London, the brainchild of Lisa Eldridge, as was the first one. Because I loved the first one so much, I decided to buy the Lancome Auda[City] in London Eyeshadow Palette after seeing swatches on ReallyRee, despite a few misgivings about cool tones and silvery shades, and duplication with the Paris palette. Scroll down for review and swatches of the Lancome Auda[City] in London Eyeshadow Palette, and comparisons with the Lancome Auda[City] in Paris Palette. Just like Auda[City] in Paris, the London palette also has 16 eyeshadows, arranged in four distinct quads. The palette comes in the same sturdy black plastic casing. The design element on the lid and the sticker on the mirror is inspired by the London skyline. Like the Paris palette, the London edition also comes with a double-ended brush. But unlike the previous palette, this year's brush is of better quality. One end is for shading while the other is for blending. Each of the 16 shadows is 1.01g in weight. The feel of the eyeshadows and the pigmentation, are very similar to Auda[City] in Paris. With one difference. The London palette has four metallic shades. One per "quad". These are arranged in the bottom row. The four metallics on the bottom row feel dry. Initially, they also felt gritty, but smoothed out as I used them. Of these, Midnight Haze - the first one from left - was nicer to work with than the other three. The rest of the shadows in the palette don't feel dry, and don't have as much fallout, with just the one dry, rough exception of Midnight Purple (far right) - which, despite the name, happens to be a black. The metallic shadows are supposed to serve as top coats for the other shadows in each quad. Two of the metallics function well enough as standalone eyeshadows - Midnight Haze and Tower Bridge. The other two metallics would work as toppers, as they have been intended. Apart from Midnight Purple, and my lack of preference for the glitter toppers, I'm happy with the other 13 shades in the palette. They are soft, lovely shades with very good pigmentation, as you will see below, and are perfect for work. I'm not bowled over by the names of the shades - I would have picked locations (Covent Garden? Regent's Park?) since they already did Tower Bridge, or names such as Telephone Box, or Colour Trooping, or Sunday Cricket over three different purples. Fourth quad: Rainy Afternoon, Purple Pageantry, Midnight Purple, Tower Bridge. Because I was generally displeased with the glitter toppers (alternate shades on the bottom row above), I decided to blow on my swatches. I was surprised when the chunky glitter just flew off, leaving a decent layer of glittery pigment behind. On my oily eyelids, the glitter toppers need primer - Kat von D High Voltage being the only primer I swear by - to work well alone. Otherwise, they can be used to oomph up a look while going from day to night. For me, they are reasonably similar and different at the same time - like Urban Decay's Naked 1 and 2. The price point is the same for both palettes. Shade-wise, I would say about four of the eyeshadows are similar. There is a pale beige; a medium terracotta brown; a black, and a shimmery dusty purple in both palettes. The Paris palette is warm-toned; the London palette has cooler tones. But the Paris palette has a lot more browns, pales and transition shades, while the London palette has some interesting greyish greens, a neat mauve, and fewer of those pale, highlighter-only shades. I feel the London palette has quads which "belong together" a bit more than the Paris palette, where the quads weren't as... cohesive - see the swatches above. I don't LOVE the four metallic shades in the London palette; they could just have made them regular shimmers. But I am, as my Mum keeps saying, "boring, safe and dressing older than your age." The double-ended brush in the London palette is far superior to the one they had included with the Paris palette. The first two are with the matte shadows in the second quad (no glitter topper); the third one is with the first quad and the glitter topper; the next one is with the fourth quad (no glitter topper), and the last two are with the third quad (no glitter topper). The two shots in the third column are taken in artificial light. I'm glad I bought this - it is among my top three for 2016. 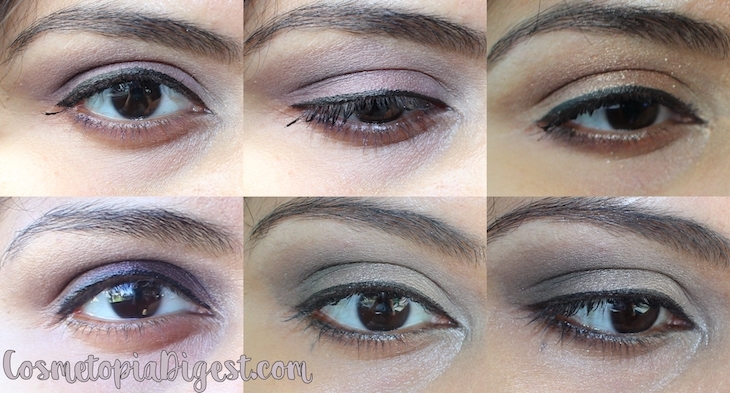 I love soft eyeshadows for daily wear, and these are exactly what the doctor ordered. Now I have three palettes to play with everyday. Favourite shades include Woody Bar, London Is Callin', Fresh Garden, and Misty Morning. I was a tad worried that the cool tones wouldn't suit my yellow undertones, but I love how these look on my skintone - the shades are right up my alley and are not what I call "meh-browns". The one disappointment was Midnight Purple - because of the name, and the dry feel in the pan. Also, I don't use glitter toppers - or glitter shadow, even - on a regular basis. I would have been happier with four regular shimmery or matte shades instead. Do you need the Lancome Auda[City] in London Eyeshadow Palette? 4. If you work or study in a conservative/serious/professional/strict/boring/safe/whatever word you want to call it - environment. You know what I mean. I bet they bring out a New York or Rome palette next year. If they have shades named after Rome's landmarks, I'm pre-booking mine! Lancome Auda[City] in London Eyeshadow Palette costs $69 and is available here at Ulta, and here at Nordstrom (they ship worldwide). If you prefer the Paris palette, or missed out last year, go here to buy. Go here for other makeup posts of the week.